Milirrpum v Nabalco Pty Ltd (the "Gove land rights case") was the first litigation on native title in Australia. The decision of Justice Richard Blackburn ruled against the claimants on a number of issues of law and fact, rejecting the doctrine of Aboriginal title recognizing that in the law of the time of British colonisation of Australia there was a distinction between settled colonies, where the land, being "desert and uncultivated", was claimed by right of occupancy, and conquered or ceded colonies. The term "desert and uncultivated" included territory in which resided "uncivilized inhabitants in a primitive state of society". The decision noted that the Crown had the power to extinguish native title, if it existed. The issue of terra nullius, later raised in Mabo v Queensland (No 2)(1992), was not contemplated in this decision. Although Milirrpum was not appealed beyond the Supreme Court of the Northern Territory, it was overruled by the High Court of Australia two decades later in Mabo v Queensland (No 2) after his death. In December 1968, the Yolngu people living in Yirrkala, who were the traditional owners of the Gove Peninsula in Arnhem Land, obtained writs in the Supreme Court of the Northern Territory against the Nabalco Corporation, which had secured a twelve-year bauxite mining lease from the Federal Government. Their goal was to establish in law their rightful claim to their homelands. The Yolngu people claimed they enjoyed legal and sovereign rights over their land and sought declarations to occupy the land free from interference pursuant to their native title rights. The Yolngu people had petitioned the Australian House of Representatives in August 1963 with a bark petition after the government sold part of the Arnhem Land reserve on 13 March of that year to a bauxite mining company. The government had not consulted the traditional owners at the time. Yolngu applicants asserted before the Court that since time immemorial, they held a “communal native title” that had not been validly extinguished, or acquired under the Lands Acquisition Act 1955 (Cth), and should be recognized as an enforceable proprietary right. The lengthy legal battle culminated in 1971. Justice Blackburn found that the Yolngu people could not prevent mining on their lands. He categorically held that native title was not part of the law of Australia and went on to add that even had it existed, any native title rights were extinguished. A doctrine of common law native title had no place in a settled colony except under express statutory provisions (i.e. the recognition doctrine). Under the recognition doctrine, pre-existing interests were not recognised unless they were rights of private property and, while the community possessed a legal system, it was not proved that under that legal system, the claimant clans possessed such rights. The clan’s relationship to land was therefore not a “right … in connection with the land” under the Lands Acquisition Act. On the balance of probabilities, the applicants had not shown that, in 1788, their ancestors had the same links to the same areas of land that they were now claiming. Blackburn examined comparative Commonwealth, Canadian, New Zealand and US jurisprudence. He accepted that the applicants had established that under traditional law any given part of the land could be “attributed” to a particular clan, but held that this did not amount to a proprietary interest. He also found that the evidence did not establish the landholding model asserted. Blackburn acknowledged for the first time in an Australian higher court the existence of a system of Aboriginal law. He also recognised the validity of the use of oral evidence to establish property rights, normally inadmissible, but a vital precondition for a successful land rights case, and he also acknowledged the claimants' ritual and economic use of the land. Milirrpum led to the establishment of the Woodward Royal Commission and the eventual recognition of Aboriginal Land rights in the Northern Territory. In 1975, shortly before he was dismissed, Prime Minister Gough Whitlam drew up the Aboriginal Land Rights Act 1976 which was later passed (in a slightly diluted form) by the conservative Fraser Government on 9 December 1976. The court interpreter for the case was Galarrwuy Yunupingu, the son of a Gumatj clan leader, Munggurrawuy, who was one of the Yirrkala plaintiffs. Galarrwuy had earlier helped his father draft the Yirrkala bark petitions. He later became chairman of the Northern Land Council and in 1978 became Australian of the Year for his work on indigenous rights. 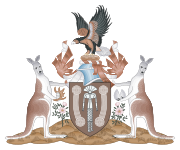 ^ a b c Milirrpum v Nabalco Pty Ltd (1971) 17 FLR 141 (27 April 1971) Supreme Court (NT). ^ a b Mabo v Queensland (No 2)  HCA 23, (1992) 175 CLR 1 (3 June 1992), High Court.